Why Good Photos help to sell your Antiques. What is your first reaction when you look at this image of the sofa for sale? Would you buy it? 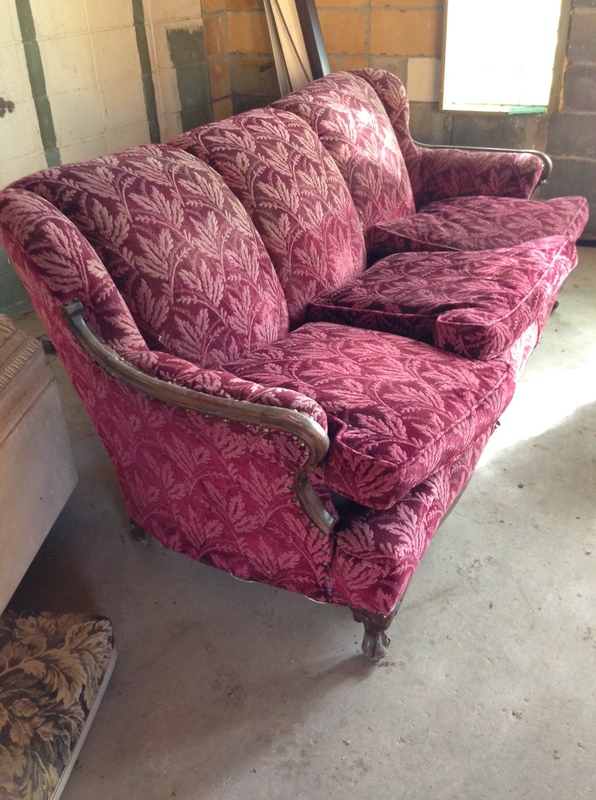 I received an email today from a friend who had received three pictures from someone she knew who was trying to sell an antique sofa and chair. The email was passed on to me in case I might know someone who was looking for such pieces. I responded that I did not know of anyone but that, if the seller indeed wanted to sell the furniture she needed to seriously look at the photos she was sending out to potential buyers. A photograph such as this one should never be sent out to anyone if the purpose is to sell it. What does this photograph tell us about the item for sale? 1. The sofa cushions are carelessly arranged. This suggests that the item is not valued by its present owner. 2. The photographs were taken in a garage, and on one photo, the sofa is shown next to garage clutter-such a dog food bag, and a box of supplies.The sofa is just another item stored in the garage. 3. Another problem with showing the sofa in the garage is that a potential buyer might worry that the sofa had been stored there for a long time. Maybe the sofa is infested with mice or bedbugs. 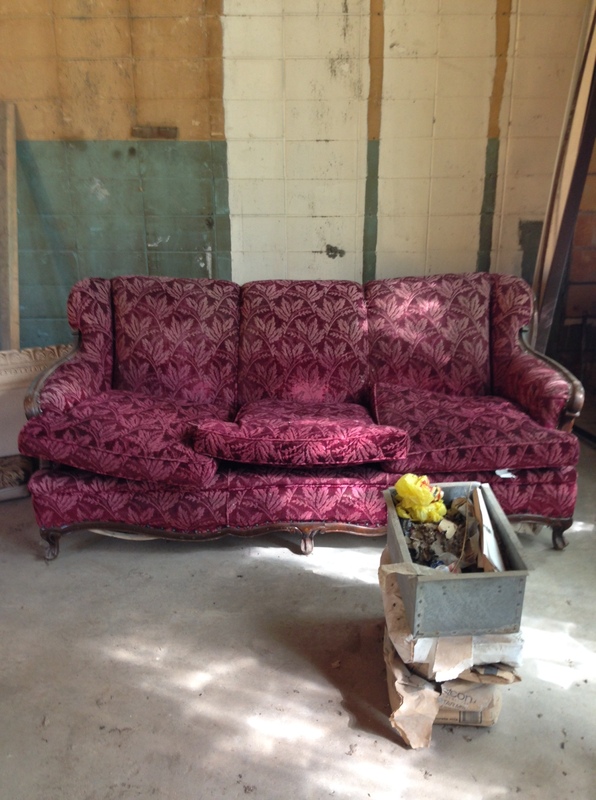 So what could you do when taking a photo of an object, such as this sofa, for sale? 1. Arrange the object as tidily as possible. In this case you could add toss cushions or create a setting so that someone could imagine what the pieces might look like in their home. 2. Get rid of all items that do not relate to the object being sold. You don’t want anything that takes away the focus of the piece for sale. That being said, well-placed accessories around the sofa (in this case) such as a lamp, or side table would help create a more attractive setting. This is called staging. 3. Consider the lighting. Natural lighting is best. Artificial lighting affects the color in a photograph. Pick the one that looks the best. 4. Don’t use flash on your camera. It makes the object look flat and drains its colour. 5. If you can’t or won’t move the furniture to a more appropriate space, create a backdrop with a plain bed sheet or another kind of fabric against which the sofa looks good. Put a rug in front of the sofa, or take the photo so that little of the concrete floor is visible. Buyers know that, by the time an item is in the garage, it’s on its way out, and it may be difficult to get the kind of money you want for it.The most important thing is to make the object look as good as possible so as to entice the viewer to go and look at it in person. The photograph you take is the object’s first salesman. It looks like they have the chair cushion in the center position of the sofa. I am looking for a sofa like this. If it showed up for sale here I would offer $50. Or less! My first offer might be $20! It is interesting to note that this particular person wanted $500 for the sofa and chair! That’s why I mention how important good photos are!